Hardened, precision-ground, drop-in hammer designed to reduce trigger pull of your Ruger Mark II or 22/45 pistol. The hammer is precision surface ground on the hammer notch for optimum performance. It is also designed to reduce lock time. 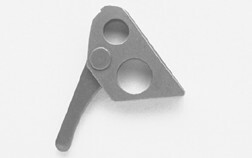 Made of stainless steel and will fit all models of the Ruger Mark II and 22/45.